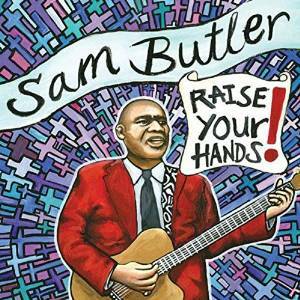 I just received the newest release, Raise Your Hands, from former Blind Boys of Alabama guitarist, Sam Butler, and it's exceptional! Opening with spiritual, blues rocker, Heaven's Wall, penned by Bruce Springsteen and it's off the hook. With it's driving guitar mantra, Butler's bluesy vocals and wild pedal steel work by Roosevelt Collier, this is a great opener. Rocker, The Lord has a driving beat compliments of Marco Giovino on drums. Butler shows his chops on this track with an almost Foghat feel! Johnny Cash's Lead Me Father has a great drum rhythm compliments of Giovino and this track is fat. With it's spiritual melody but rock like vamp, and soaring guitar soloing, this track is cool! Eric Clapton's Presence Of The Lord has a really nice redo. I think most everyone on the planet has heard this track and this is such a soulful makeover, with subtle but tasty guitar work and then meaty guitar frenzy, it is almost unrecognizable. Absolutely remarkable! Tom Waits' Gospel Train has a real theatrical feel and a dark overtone. Butler's vocals riding the bass line of Viktor Krauss and Butler's solitary guitar lead is solid. U2 track, Magnificent, is much more appealing to my ears than ever by U2. A solid rock beat and Collier's pedal steel searing the melody from the bottom carries Butler on lead vocal and guitar for what could be the radio track of the release. Very nice! Van Morrison's Full Force Gale, has an ethereal feel with a lot of open sound and a solid drum pattern. Butler gently lays his vocals on the slipstream as they ride along on a cloud of music. Masterful! Lee Ann Womack's All His Saints builds almost like a the soundtrack for a battle. Slowly gaining power as it goes with tom toms, reverb guitar, and Butlers powerful vocals. Nice Cave's God's Hotel is a stripped down rocker with Howlin' Wolf like gravelly vocals by Butler and well balanced rhythm and pedal steel backing. Curtis Mayfield's Wherever You Leadeth is as sweet as soul music gets. I personally think that Mayfield is one of the great masters and Butler does an excellent job on this classic. With his easy interpretation of Mayfield's sound and lush guitar work under the melody, this is one of my favorites tracks on the release. Swampy, Long Black Cadillac, has such a great feel with strong vocals, a rhythm part and great interweaving of bass, guitar, and pedal steel, this track is super. Wrapping the release is Eliza Gilkyson's Sanctuary, a solemn track featuring Butler's soulful vocals guiding nicely presented pedal steel work. Collier does an absolutely terrific job on this track adding to it's already powerful impact. Excellent!